File this under “see you in court”. Jay Ashcroft (r) [2015 file photo]. Jefferson City, Mo. — Advancement Project’s National Office and The American Civil Liberties Union today sued Missouri over the state’s new photo ID law. The case was filed on behalf of the Missouri State Conference of the NAACP and the League of Women Voters of Missouri. The groups are seeking a temporary restraining order to block the law from being in effect during a local special election on July 11. In-person absentee voting for this election begins this Monday, June 12. An additional 52 Missouri counties go to the polls on August 8. 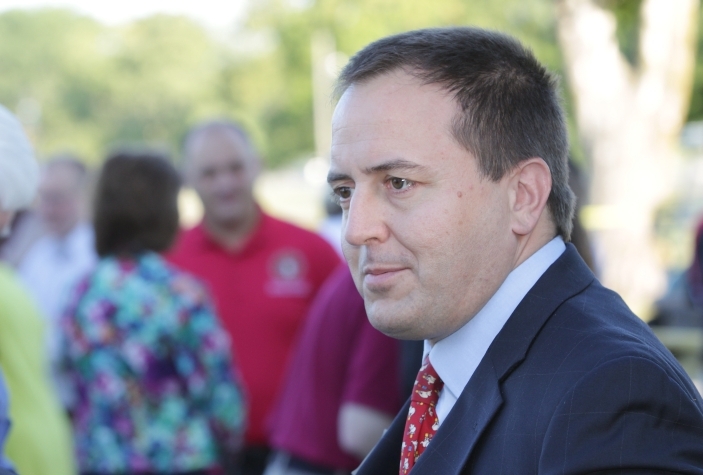 The request was made in part because Missouri’s chief elections official, Secretary of State Jay Ashcroft, has admitted the state would be unable to implement the requirements of restrictive photo ID law in time for this election and the state has yet to allocate funds to the Secretary to implement the law. “States are not allowed to make an end run around voting rights by forcing burdensome changes to election law and then failing to provide the required funding for proper implementation,” said Sophia Lakin, an attorney with the ACLU’s Voting Rights Project. Texas, Wisconsin, and Pennsylvania are among the states that have already been reprimanded by the courts for disastrous implementation of their voter ID laws and inadequate, confusing voter education. The case, Missouri NAACP v. Missouri, was filed in Cole County Circuit Court. It ain’t a pretty image. She voted with the republican majority in the House to authorize a lawsuit against President Obama. I don’t think they actually wash and rinse. That assumes facts not in evidence. One can only hope, Bob. Plaintiffs-Appellants contend that Barack Obama is constitutionally ineligible to be President of the United States. United States District Court Judge David O. Carter dismissed Plaintiffs’ constitutional claims, as well as their claims for declaratory and injunctive relief, for lack of standing. We affirm the dismissal for lack of standing, albeit on somewhat different reasoning than that of the District Court. Well, that was short and to the point. In South Lake Tahoe, we rejected as insufficient to establish standing a similar contention that a public official could conceivably be exposed to civil liability while carrying out his official duties. 625 F.2d at 238-39. We noted that whether the officials could in fact be subject to civil liability was dependent on “multiple contingencies,” including the likelihood of any civil suit and the question whether the official would be immune from any such suit. Id. at 239. The alleged harm to the state representatives in this case is just as speculative and conjectural as in South Lake Tahoe, for similar reasons. This group of plaintiffs therefore fails to establish standing. See Lujan, 504 U.S. at 560-61. The District Court properly dismissed the plaintiffs’ constitutional claims for lack of Article III standing. Moreover, the District Court did not err in dismissing Plaintiffs’ quo warranto, FOIA, or RICO claims. Accordingly, the dismissal by the District Court is AFFIRMED. Appellants’ emergency petition for writ of mandamus, filed November 8, 2011, is DENIED. Gary G. Kreep, Ramona, California, and Orly Taitz, Rancho Santa Margarita, California, for the plaintiffs-appellants. That reads a might testy. It’s gonna be really interesting when Speker Elect Jones (r) takes over. ST. LOUIS, MO — Advancement Project, the Fair Elections Legal Network (FELN), the American Civil Liberties Union of Eastern Missouri and the ACLU of Kansas and Western Missouri today announced a legal challenge to a ballot proposal to amend the state constitution’s voting requirements, saying that the ballot language misleads voters and if passed will restrict the voting rights of Missourians, including the elderly, people with disabilities, and students, among others. The ballot initiative, SJR2, slated to be placed on the ballot for November 2012, was passed by the legislature in May in an attempt to circumvent the Missouri Supreme Court’s 2006 ruling that restrictive photo ID voting laws are unconstitutional. The lawsuit – the first-ever challenge to a constitutional amendment on photo ID laws and the first lawsuit in the nation filed challenging the rash of photo ID proposals introduced in states across the country this year- was filed on Wednesday and names eight Missouri voters as plaintiffs…. Yep, true to form, republicans will do anything to suppress the vote of their opposition. They have a plan. Missouri Attoney General Chris Koster filed an amicus brief [pdf] today in a federal lawsuit challenging health care reform. …Although these are complex questions on which many scholars, judges, and interested parties sincerely disagree, it is the opinion of this office that the Congress reached beyond current Commerce Clause precedent when it regulated that individuals maintain “minimum essential [healthcare] coverage” or pay a penalty. Therefore, it follows that the federal courts, in reviewing this aspect of the law, must either expand Congress’ Commerce Clause authority, justify the provision on alternate constitutional grounds, or strike down the individual mandate. It is also the legal view of this office that the individual mandate is severable from the ACA and that those provisions of the bill not clearly dependant upon the mandate may stand. Our argument against the expansion of Congress’ Commerce Clause authority is emphatically not based on any opposition to the expansion of health coverage for uninsured Americans. Randy Turner at The Turner Report has a post up about focus group results released as part of the discovery in the Faux News Channel lawsuit against Robin Carnahan’s (D) 2010 senate campaign. There’s an interesting refrain about ACORN, showing that the rightwing’s assault based on fake charges and Congress’ capitulation with a bill of attainder did more damage than just shutting down the group which legitimately registered voters and provided other legitimate services. Documents turned over to Fox News attorneys by a consulting firm provide evidence why Roy Blunt defeated Robin Carnahan in last year’s U. S. Senate race…. -Why was she quiet about ACORN?…. -May have ignored problems with ACORN, whatever that is…. -She is too close to ACORN. -I would want to know if there is any truth to those ACORN accusations…. -Too cheesy or fake with the farming. Too tied in with ACORN…. -She is too much a yes man for the president. She also caused too much money to given to the ACORN people. -How closely is she tied to special interests like ACORN?…. Never mind that the rightwing and their Mighty Wurlitzer stooges beat their truthiness drum. As we can see, all they have to do is repeat the lie. ….Get that – the videos were “edited to meet their agenda.” In other words, these full-of-themselves rightwing echo chamber trainees, O’Keefe and Giles, were running a scam. The Brooklyn investigation is the third such to cast doubt on O’Keefe’s and Giles’ veracity. Investigations by the former Massachusetts Attorney, Scott Harshbarger, and the Congressional Research Service have found ACORN innocent of wrong doing…. On Monday, June 14, a preliminary probe by the U.S. Government Accountability Office (GAO)of ACORN has found no evidence the association or related organizations mishandled the $40 million in federal money they received in recent years. A review of grants by nine federal agencies found no problems with ACORN’s grants. In my book Seeds of Change I document how ACORN, the largest most successful national anti poverty organization in America, was forced to close its door…. ….In fact the staff in most of ACORN’s offices turned the pair away, reported the couple to the police, refused to provide them any aid, and in one case tried to convince the phony prostitute to get counseling. In no ACORN office did employees file any paperwork or do anything illegal on the duo’s behalf. But Fox News broadcasted the deceptive tapes nearly around the clock for several days defaming ACORN…. Ironic, eh? And they have a plan. HR 39 was passed last week by the House. The resolution calls for Missouri Attorney General Chris Koster (D) to join in the frivolous anti-health care reform lawsuits getting smacked down in federal courtrooms across the country. ….The full House already voted on some bills this week. I’m pleased to report on a resolution to urge Missouri to join 20 other state attorneys general in a lawsuit questioning the constitutionality of the federal health care requirement. I voted for HCR 39 and am hopeful Missouri Attorney General Chris Koster will enter into this lawsuit to make health insurance a personal choice…. ….Representative Kelly (24) offered House Amendment No. 4. 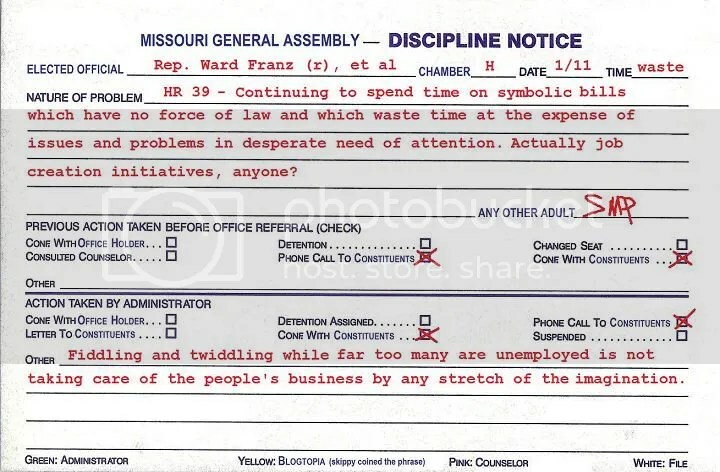 “Missouri Lieutenant Governor”, and inserting in lieu thereof the words “private citizen”…. Uh, that’s legal talk for the lawsuits being a colossal waste of time. ….Because CBO and JCT estimated that the March 2010 health care legislation would reduce budget deficits over the 2010-2019 period and in subsequent years, we expect that repealing that legislation would increase budget deficits. The resulting increase in deficits projected for fiscal years 2012 through 2019 is likely to be similar in size to-but not exactly the same as-the reduction in deficits that was originally estimated to result from the enacted legislation…. As a result of changes in direct spending and revenues, CBO expects that enacting H.R. 2 would probably increase federal budget deficits over the 2012-2019 period by a total of roughly $145 billion (on the basis of the original estimate), plus or minus the effects of technical and economic changes that CBO and JCT will include in the forthcoming estimate. Adding two more years (through 2021) brings the projected increase in deficits to something in the vicinity of $230 billion, plus or minus the effects of technical and economic changes…. There you have it. The federal lawsuits are a waste of time and repeal of health care reform would significantly increase the deficit. For republicans, what’s not to like? WARRENSBURG, Mo. – The sexual abuse lawsuit filed by six Warrensburg High School female athletes has been settled out of court, with the school district’s insurer agreeing to pay the girls $809,000…. ….The girls’ attorney, Ronnie Podolefsky, told Digitalburg Thursday that while the girls were happy about the settlement, “It was never about the money. We never requested money.” It was about ethics and civil rights, she said. $809,000.00 is a lot of money. It does speak for itself, don’t you think? Interestingly, in addition to Ronnie Podolefsky, the plaintiffs also had Roxanne Conlin representing them. Yes, that Roxanne Conlin. Heh. There’s got to be somebody at Faux News who spoke up at a meeting and said, “let’s sue Robin Carnahan’s campaign for using some of our video clips in an ad” who is thankful that he doesn’t have to clear his desk out at the end of business today only because everyone else around the table probably agreed so enthusiastically that it was a mondo boffo idea. Mindy Mazur: Hey, guess what I’m doing? I’m standing up to Congressman Blunt. And you should, too. And while we’re doing that we’re gonna stand up to Fox News as well. Their parent company has given Congressman Blunt ten thousand dollars over the years. But in just one day we’ve already gotten four hundred donations supporting us in standing up to tell the truth. But we want five hundred. George in St. Louis, thanks for being number four hundred. You out there who haven’t donated yet, it’s your turn. Help us out, go to Robin Carnahan dot com. Thanks. My advice to Robin Carnahan’s campaign – keep beating this like a big bass drum.